Here we go again, we have gone full circle and put another golf season behind us. The calendar is on its last page. The maintenance crew has been whittled down to the old timers, while the young bucks have long since gone back to school. I sure hope it was a good one for you. If not, put last year’s frustrations behind you start with a fresh plan of ideas to improve on the past year. The transition of fall to winter has always been one of my favorite times of year. We can now take that deep cleansing breathe to clear our minds of the golf season rush. It’s time to map out the maintenance work that needs to be done in preparation for next season like the role of a head coach who has to decide which repairs make the budget cut or not. While making repairs or not, safety for ourselves and others around us should always be on our minds. I follow a couple of golf course related social media pages and a picture posted of a techs injury really got my attention. The tech just had sixteen stiches put in his nose after a bed knife fileted it open. My first though was an inch or two one way or the other and the poor guy could have lost an eye. He will always have a story to tell about that scar across his nose. My father used to always say we are all blessed with 20/20 hindsight. Sure with the power of hindsight this accident may not have happened. Turn the hindsight around to foresight and become proactive on preventing accidents. Look around your shop and work zone and take a good look for potential dangers and changes that will make it safer. Start with your tool box and work area. A fire extinguisher should be mounted to the side of your tool box because odds are, your tool box follows you around the shop. There are many more prime spots to mount fire extinguishers such as on the welder, oxygen and acetylene torch cart, in the reel grinding area, near the parts washer, lubricant storage area and at the fuel pumps. By the way do your fuel pumps have an emergency shut off that everyone is aware of? 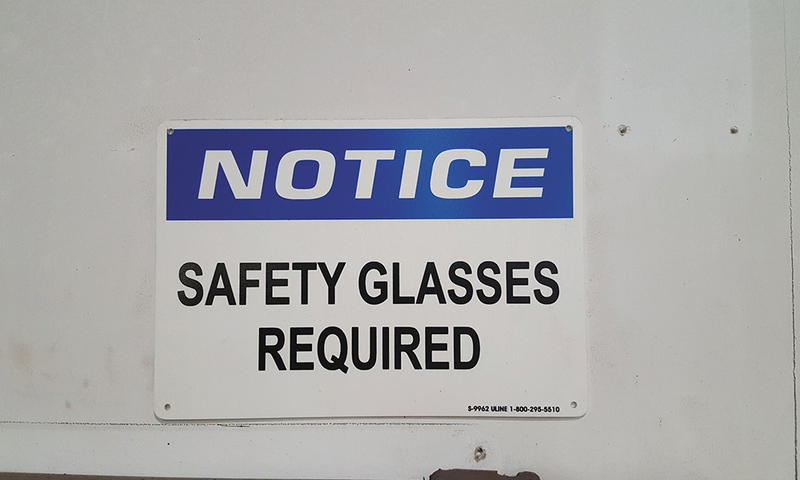 A good pair of safety glasses with side shields or a full face shield should always be close buy and used. I have made the trip to the ER for a piece of metal debris in my eye. I learned after the second trip, and safety glasses became my best friend. Don’t forget hearing protection while using grinding equipment. I am now in my fifties and I have some hearing loss because I was hit or miss on wearing ear protection. Take a look at the shop bench grinders. Are the stones worn down too small, are the guards in place and tool rests adjusted correctly. I have seen a man lose the end of his thumb while using a bench grinder without a tool rest in place. As he was leaving to go to the ER I went to the grinder hoping to retrieve any of his thumb, but it was gone. You can’t take a Mulligan do over on that one. I could comment on a few more stories of injuries to fingers and hands but I will leave that up to your imagination. Things that make you go hmmm. Do you have an equipment lift in your shop? Now is good time to takeout the owner’s manual and make a good inspection of this equipment. Are the safety stop mechanisms in place and working? Are the lift cables frayed? They do break at the most inopportune time! Speaking of lifting equipment. What condition is your floor jack in? Do you know where your jack stands are and do you use them? All it takes is that one time to be in a hurry and not use jacks stands. Gravity can make a heavy object like a mower fall fast and hard. Do you have an eyewash station and a first aid kit? A bonus to the first aid kit would be a tourniquet. Does your Golf Club offer first aid training? If not make suggestion that they should. The Red Cross offers excellent first aid training classes including CPR and how to use an AED or Automated External Defibrillator. I have seen an AED used to save a golfers life early on a Sunday Morning. This one will make a few people laugh, but seriously if you had to make a phone call to get emergency help, do you know the physical address of where you are working? I have talked to people more than once in conversation that do not know the physical address of where they are working. Long before there was such thing as GPS, I was on a job where a water main broke and had to make a call for help. I had no idea of the address or city we were working in. Another lesson learned that day. Nothing like life experiences that turn into knowledge. With that being mentioned, do you have a communication device such as a cell phone or 2 way radio to summon help if needed? Having communication is imperative in rules of safety. When you have been in any business for any length of time, you will have seen many things and have stories to tell. This is not meant to be a sermon or a lecture. This is just to create awareness of how some simple ideas or even new ideas can protect you from injury or even worse death! Slow down and perform that repair or maintenance the right way, the safe way. With a twist on Dr. Spock’s words live long and work safely. See you all next year. My email is always open for your ideas, questions and suggestion on how to educate and communicate with each other. Feel free to contact me at mxk92@yahoo.com.